There are very few movies that I would call ‘unique’. Certainly, a movie need not be unique to be enjoyable or even of excellent quality. And, just as certainly, unique can be applied to something bad - in which case, we are glad it is unique. A Canterbury Tale is, however, most definitely good. 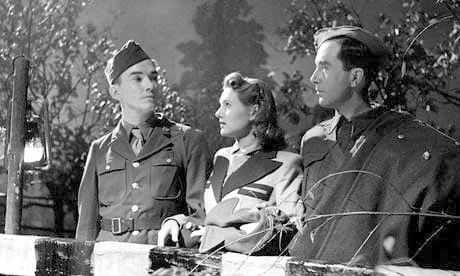 The story takes place in the present day (present day when the film was produced (1944)), and concerns three people - an American soldier (John Sweet), a British soldier (Dennis Price) and a girl (Sheila Sim) from the Land Army (agricultural labour volunteers during World War Two) - who meet while passing through the village of Chillingbourne, Kent. Almost immediately, Sim is assaulted in a bizarre manner - a stranger rushes by and pours glue on her head. The trio learn that ten other women have been similarly victimised, leaving them unhurt but bewildered. Amateur investigations lead to the local magistrate (Eric Portman). 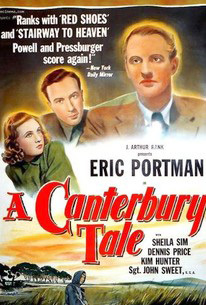 From the plot’s synopsis, one might conclude that A Canterbury Tale is a light-hearted mystery. But the mystery is a bit of a red herring; it is an introduction to what is, in fact, a propaganda film. But there are no flags waving or trumpets blaring. This is a tribute to the greatness of England - not its military, nor its politics - but to what truly make a country great: its people, its buildings, even its agriculture and handicrafts. There is, running through the story, a theme about connections and continuity, among time and places and people. This is demonstrated, at first, in an obvious manner, comparing fourteenth century pilgrims on their way to Canterbury to travellers destined for the same city six hundred years later. But associations show up throughout, as when Sweet compares Canterbury Cathedral to the much more humble church in Oregon that his great-grandfather built, or when Price, whose dream of being a church organist was diverted into the reality of playing in a cinema, meets the cathedral’s organist, who started out playing in a circus. Dates crop up all the time, whether mentioned by a stationmaster about how old his ‘municipal borough’ is, or seen carved on a door. A wheelwright talks about how his father and his father had done such work. The conclusion I drew was that the makers of A Canterbury Tale saw a nation’s strength in the ordinary things that were constant, in some form, through eons, and that this strength could be found between nations and peoples, as well. And who were the film-makers? 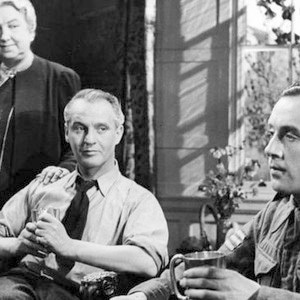 Michael Powell and Emerich Pressburger (“The Archers”) worked so well together that the credits show the film as ‘written, produced and directed by’ both of them. 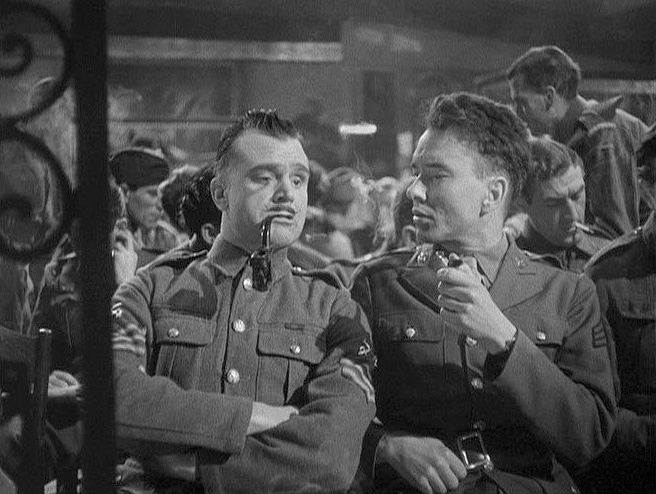 They created some of the best British films of the 1940s and ’50s, and this is one of their gems. The writing brings forth characters that are very different yet all sympathetic in their own ways. Sweet, an easy-going son of pioneers; Price, whose cynical face often put him in apathetic characters, and Sim, a happy girl hiding a secret heart-ache, are all human, their personalities quite different yet, believably, friends to each other. Portman’s local magistrate is equally well-written and played, a man who, while initially almost sinister, comes across as someone with a local patriotism that may seem obsessive, but whose deep love of his land keeps its story alive. The story-telling is gentle. There is a scene in which two characters compare methods of cutting and seasoning wood (“one year for every inch of thickness”); it’s about seven or eight minutes long and doesn’t add anything to the plot, but adds immensely to the people and atmosphere of the film. 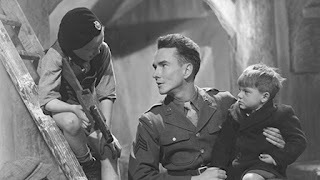 Another scene shows a mock war of little boys at play (back in the days when children could play ‘guns’ without either a policeman or a psychiatrist being summoned); this eventually progresses the plot, but the same could have been done using no more than a minute of the film. The photography is beautiful; warmth, colour, scents, are all conveyed in black-and-white photography. 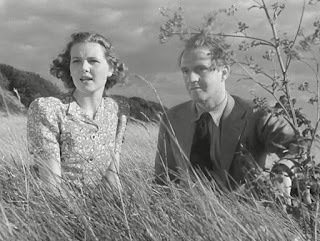 Images of clouds (presaging a warm day), landscapes and distant vistas, show an England clearly dear to the film-makers’ hearts. The direction demonstrates that the nation is not just in fields and cottages: the shops and businesses of heavily bombed Canterbury carry on, and a shot of the cathedral down a narrow lane includes a sign for Boots the Chemists, as English an institution as tea. A Canterbury Tale is a war-movie without battles, a romance with kissing, a propaganda film without boasting, a psychological drama without angst, a comedy without belly-laughs. Crafted by a native-born Englishman and an immigrant who became a British citizen, A Canterbury Tale is an understated but nonetheless immense tribute to a loved country, and to the people and ways of life that made it. And I just saw that it's available for free on YouTube! I'll be interested to know what you think. If you see it, you can email me with your opinion at hughbetcha@shaw.ca. I'll check it out this weekend. As an Anglophile, I should like it. By the by, I watched this film over the weekend, and greatly enjoyed it! It was, as you said, a unusual movie, and quite charming. It was also striking how, while it could be called "wartime propaganda," it sought to rally people not by demonizing "the enemy," but by paying tribute to the country everyone was trying to defend. By the end, though, the movie made me rather sad. It depicted an England that (to the extent that it ever really existed,) is probably long gone. I'm glad you liked it. I too felt that I was watching a tribute to an England that was already vanishing, even as the Nazis were seeking to destroy it. I suppose it was inevitable with industrialisation, globalisation, mechanisation, and all the other -sations. Perhaps Powell and Pressburger knew that and wanted to capture its essence before it disappeared. That they did showed their skills as film-makers. Thanks for stopping by, guys. I know you're busy with the move; I hope you'll have time to relax a bit soon.